I can’t believe it’s been over a month since my last post. Where has the summer gone? My kids have been back in school for three weeks already. The apples in our orchard are just about ready to pick. And our herd of deer are quickly losing their orange summer coats and molting into their thick, gray post Labor Day apparel. This summer has been quite a blur. There’s still so much more to do around the new homestead. But at least I’ve finally managed to clean up and organize the new shop. It’s only been a couple of months but I feel like I’ve been away from it for much longer. I’m looking forward to the fall weather when it should be much more comfortable to work in the uninsulated, unheated & uncooled space. The new shop is set up and ready for business. I’m amazed at how much more room I have in the new space. It feels almost like a TV studio because it’s so deep. With a bit of remodeling this old shed could really be turned into something pretty spectacular. There’s only one problem…it’s kind of falling apart and sinking into the ground. 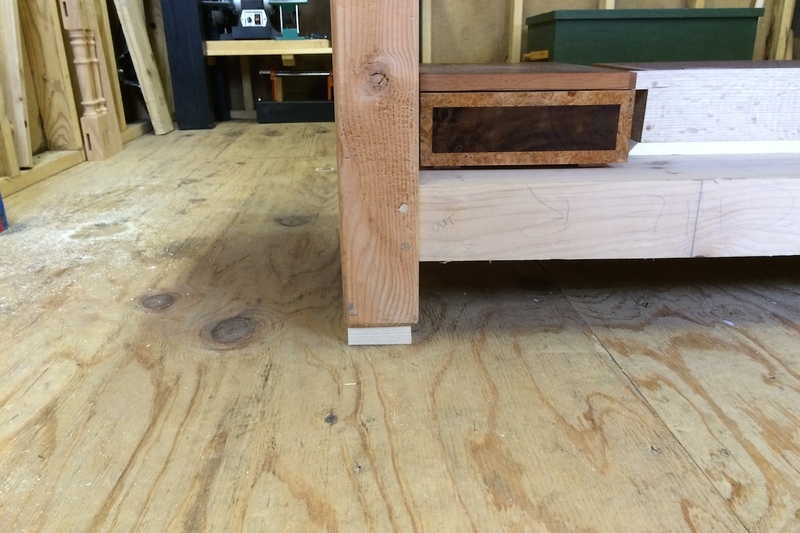 Do you see that light colored stripe under the left leg of the workbench? This “shim” is a block of ash that is just over 1″ thick. That’s a square block of ash that I had to put under the front and back legs on the left side because the building is so out of level. I mean tools roll off the bench and out the door out of level. Things don’t look too bad in the pictures here because I went to great pains to level all of the items hanging on the wall as well as the workbench. But believe me, it’s bad. So bad that when I hung my wall cabinet, I had to use a french cleat because once leveled, the cabinet could be screwed into two studs at the top, but at the bottom of the cabinet (only about 30″ lower), one stud had completely angled away from the cabinet. In addition to the fact that the building is sinking because it’s just sitting on skids that are resting on cinder blocks that are just sitting on top of the ground, there are plenty of other issues. The siding is so rotted I’m surprised it hasn’t blown away with the strong winds we sometimes get up here in the mountains. When I tried to add nails to it to repair the areas where it had separated from the framing, I could push the nails right through by hand. It ripped like tissue paper. Then there’s the roof. The sheathing and facia boards are all rotted around the edges and the shingles are in pretty sorry shape. There’s an inch-and-a-half gap around the door that a neighborhood bat occasionally takes his daily naps in. And the rollup door, well, don’t get me started on that. Let’s just say that there’s no question where the hundreds of wasps I evicted came in from. Oh, and several of the floor joists have visible termite damage and signs of rot. So who knows how long the floor will hold out. So while my original plan was to remodel this building, it turns out that it’s going to be much less of a headache to simply start from scratch. But, as much as it sounds like I’m complaining, I’m really not. I’m actually really happy to have someplace to get out to and do some work in again after being out of the shop for several months. Plus, it gives me the opportunity to really think about what I want to do when I build the new shop. My original intent was to turn this into something that resembled a building from Colonial Williamsburg. 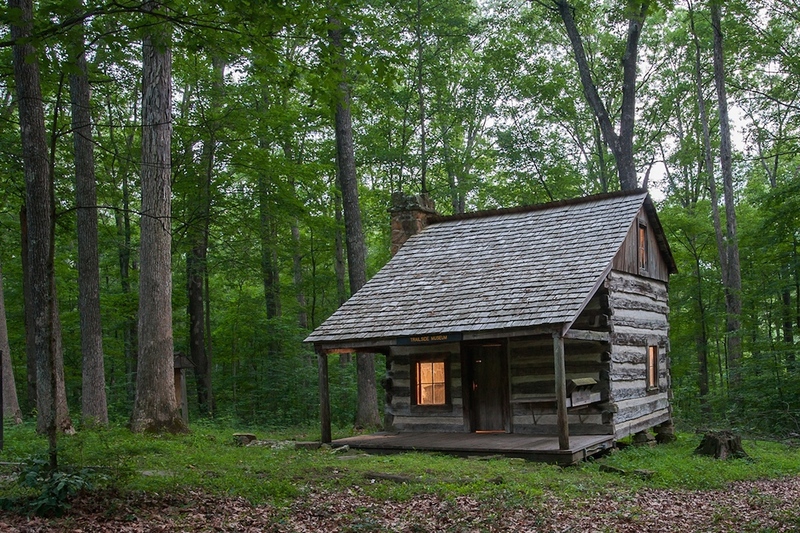 But after some discussion with my wonderful wife, we’ve decided that an Appalachian log cabin would be more appropriate. After all, we’re going to be building a log home on the property, so a traditional Appalachian log cabin would fit right in with the new house. So for now, I’m doing some more cleanup around the property, tearing down some old, rotted livestock fencing, preparing for the massive apple harvest that we’re going to have in a few weeks, and dreaming of a new old log cabin. Lucky for me, there’s lot’s of inspiration around these parts so I’ve got lots of ideas to get me started. Maybe I can convince my wife to let me start in the spring. You know, practice for the new house and all. I better start shopping for a good old broad axe. It’s good to know when to cut your losses. You’ll still be able to work on stuff in the shop though, right? At least in the mean time? And please tell me you’ll be using 21st century technology to build the new structure. I’m hoping your ax comment was tongue in cheek. If not, more power to you; alcohol power that is. Thanks Bob. Yep, I can use the shop for now. It’s just not a good long term option. As for using 21st century technology to build the shop, maybe. It will have electric lights. That’s modern technology, right? As for the axe comment, maybe some tongue in cheek, but not all that much 🙂 . I have been out of woodworking for almost two years tending to life. So glad you are still around. I am also a hand tool purist (except for a drill press and band saw). I love watching your podcasts and am wondering if you intend to produce more in the future? I’m not going to say a definitive “no” as I’ve learned through the years that about the only certain things in life are change, death and taxes. But at this point I have no immediate plans to do so. I’ll certainly miss your podcasts. Always interesting. And the Nicholson Workbench series – one of the best on workbenchs out there! Best Wishes on your ‘ new life’ – and on the new workshop. 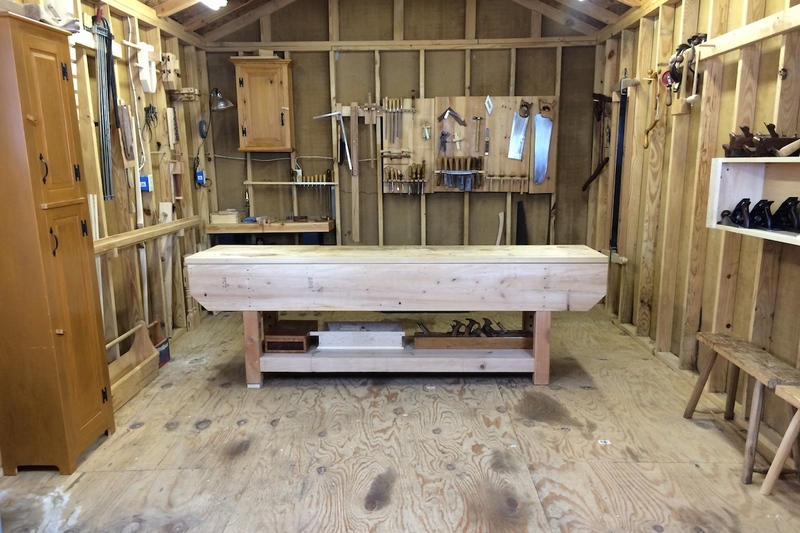 Remember, if you at least capitulate to using a chop saw and jobsite contractor table saw – you will be back to handwork in the new shop that much sooner? Thanks Chris! Hoping to do log walls to match the house we’re building. So a chop saw and jobsite table saw will be of little use ?. Now a chain saw, on the other hand…. We start on the house after the new year. Hopefully the new shop won’t be far behind. But right now I’m not working on either. Our family was recently adopted by a pair of stray/abandoned dogs. They showed up a few days ago and decided they weren’t leaving. So it’s been an interesting few days. They’re living in the shop right now, until we’re sure they have a clean bill of health and won’t pass anything on to our other 13 year old dog. So still no woodworking at the moment.